Typhon's Fang as 3rd item is probably not optimal. It's fairly expensive, and needing that much lifesteal that early probably means there's a problem. She's not a boxer...she's going to try for distance CC/damage, and use her escape if needed, so she's not going to be looking to lifesteal to keep her health up in a fight. Lifesteal is also not very efficient for her, though Bancroft's Talon is perhaps okay. 3 of her 4 abilities are AOE/multi-target, which reduces individual lifesteal application to 1/3. In fact, she's typically not built with lifesteal at all. If anything, she might get Pythagorem's Piece situationally, because it's got great team effect and CDR. You can get Bancroft's if you want, but don't recommend double-lifesteal at all. I feel the main thing this build is missing is Spear of the Magus. It's what I would consider basically a core item, and the stacks work well with the tick damage from Shadow Lock. 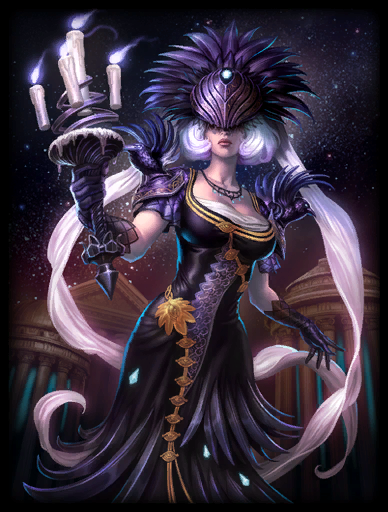 Although also expensive, you probably will find better use of Chronos' Pendant earlier in your build. She benefits greatly from CDR, to apply that crazy silence at will, and have more opportunities to lock down enemies for group kills. Finally, your skill leveling is screwy, no offense, and not optimal. You've got 4 points in Shadow Step and Shadow Lock, and are missing levels 10 and 18. Siphon Darkness can be maxed first for wave clear, but your next focus typically should be Shadow Lock over Shadow Step. It not only is an ability you'll use every time you engage, but can apply those Spear of the Magus stacks once you have that item. Shadow Step DOES have higher damage potential (IF you hit an enemy god on your way to a teammate, then exit the shadow to get the 2nd hit)...but won't be used in every engagement, because you'll often want to save it in case you need an escape. As such, you should have Siphon Darkness leveled at 1, 4, 6, 7, and 10. You should have Shadow Lock leveled at 2 OR 3, 8, 11, 12, and 14. Shadow Step should be leveled at 2 OR 3, 15, 16, 18, and 19. Please don't get Meditation Cloak as a relic. Purification Beads + Aegis Amulet are your 99% go-to combo. If anything, you might have Phantom Veil as an alt relic. Why doesnt nox play as an assassin supporter. Her abalities to lock down and silence enemies seem like a great combo with assassins. Not only that but say the assassin youre playing with is super fast you can hop in his shadow and let him carry you. 130619 Vladimer Tepez Why doesnt nox play as an assassin supporter. Her abalities to lock down and silence enemies seem like a great combo with assassins. Not only that but say the assassin youre playing with is super fast you can hop in his shadow and let him carry you. I mean she can be played in support as well as mid role. And another thing, why does this build have so many upvotes? 130621 Kriega1 I mean she can be played in support as well as mid role. And another thing, why does this build have so many upvotes? Assassins are roamers. Nox can play early game as a general Duo support, and leave early (once the ADC is self-sufficient) to also roam the jungle and look for ganks. At this point, she can group up with the Assassin for ganks, but if she goes everywhere the Assassin goes, they'll both suffer on XP/gold. And yes, jumping into a teammate with global ult is a strategy...can work well with Thanatos, Thor, Athena, Ratatoskr, etc. But I don't suggest playing as what you phrase as an "Assassin Support." 130620 Branmuffin17 Assassins are roamers. [[Nox]] can play early game as a general Duo support, and leave early (once the ADC is self-sufficient) to also roam the jungle and look for ganks. At this point, she can group up with the Assassin for ganks, but if she goes everywhere the Assassin goes, they'll both suffer on XP/gold. And yes, jumping into a teammate with global ult is a strategy...can work well with [[Thanatos]], [[Thor]], [[Athena]], [[Ratatoskr]], etc. But I don't suggest playing as what you phrase as an "Assassin Support." Why no one is explaining their item choices? 128519 DrinksAdmirer Why no one is explaining their item choices? Because this is a build and not a guide. 128521 Gulfwulf Because this is a build and not a guide.